Gear: winter Layers Everest Winter, No O’s Attempt! “I Want to Climb Mt. Everest” is one of the top hits I get for my website and in emails. I understand. In this post, I will cover what it takes and a path to get there, with the disclaimer that there are many paths to reach any destination. I will cover the cost at the end of this post, but I know that many readers believe if they can afford it, they can do it – what a huge mistake regardless of if you spend $25,000 or $125,000. My basic philosophy is that a climb should be a positive experience and if you summit, that is a bonus. My belief is that climbing Everest is about the experience, not the summit. I can attest to this after attempting it three times, without a summit, and achieving my goal on the fourth time. I firmly believe that anyone attempting Everest should have attempted, and hopefully summited, an 8000 meter mountain. The usual suspects are Cho Oyu and Manaslu or perhaps Gasherbrum II in Pakistan. This experience will reveal how your body performs at extreme altitudes – something you will never discover in a climbing gym or an altitude tent. 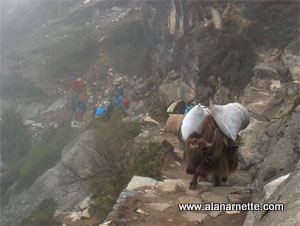 But there are many steps required before attempting any 8000 meter mountain. In my opinion the best path to Everest includes ever climbs of increasingly difficulty and higher peaks where you will learn the skills required to have a positive experience on Everest. This path may include starting with a climbing school, then a peak like Rainier, Mont Blanc or Tasman in New Zealand. Summiting Kilimanjaro is good but will not provide the experience needed for Everest. Many guide services will suggest that climbing Everest is simple and with so many people on the mountain there is little danger and only basic climbing are needed. You should avoid those guides. In 2016, five people died on the mountain and most could have been prevented. While Everest from either side is not overly technically as compared to K2 or Nanga Parbat, the climbing does require advanced climbing skills. For example, on the south side, climbing the Yellow Band, the Southeast Ridge and the Hillary Step require basic rock climbing skills. But don’t be fooled., while you may be a Star on your home crags, everything changes above 20,000 feet. You need to have your techniques dialed into your muscle memory. You must climb with no thought as to technique other than double checking each anchor and clip into the fixed rope. A mistake will cost you your life. The only way to get those ‘muscle memory” skills is thru climbing. Why do you want to summit Mt. Everest? A simple question that many on the mountain struggle to answer. When it is 2:00 am in the dark with temperatures at -20F and the winds kicking up to 30 mph, you will ask yourself why. If you cannot answer yourself in that moment, you are likely to surrender to the elements and retreat to the nearest camp. No shame in this but if you are clear with your motive, you can dig deep and go on. I know many climbers who will return in 2017 after not summiting in previous attempts. Some were caught up in politics, other in the tragic earthquake of 2015 and then some who simply were not ready. For those few, they know why they are returning. They are clear and focused – as it should be. To climb Everest means that you are not in the best shape of your life but in Everest shape. Rock climbers will brag about climbing 5.11c – with a top rope. This means little on Everest. To climb Everest means you have immense stamina, a deep reservoir and metal toughness . The best way to get in Everest Shape is to climb. A program of ever increasing mountains of altitude and difficulty with qualified guides or teammates is the best program. It is so easy to give up on Everest, or worse, to push hard when you should turn back and not die. In covering or climbing Everest since 2002, I have seen an alarming trend of novice climbers dieing on the mountain. The low prices and misleading marketing are seducing novice climbers to sign up not knowing what is required. When you are at 27,000 feet in a blowing wind, struggeling for breath and alone – yes you may be alone – that is the time to draw on your experience, training, motivation and metal toughness. AND it may be a good time to turn back. I know, I turned back three times just below the Balcony at 27, 500 feet before summit on my fourth attempt in 2011 at age 54. To climb Everest, you must be willing to spend your money. The range is huge from $25,000 to $125,000. You may perk up at the $25,000 price but do not get seduced. The permit alone is $11,000 for a Nepal climb and $7,000 from Tibet. But that is just the beginning. Over 97% of all Everest summiteers use supplemental oxygen adding thousands to the price. An ever greater percentage go with a guide company. The gear alone, if you have nothing, will cost over $5,000. In the end the average cost to climb Everest from the North is around $35,000 and $40,00 from the South. I am updating my How Much Does it Cost to Climb Mount Everest? annual post for the 2017 season. Climbing Everest is not easy. It is not for beginners. It is not to be rushed. Climbing Everest is a privilege. It is a right that should be earned. When you fly into Kathmandu, you may see Everest out your window. It is at the same level as your airplane is flying. Let that sink in. So, yes climbing Mount Everest, Chomolungma, Sagarmatha or Peak XV is life changing. Climb with confidence that you are prepared, knowledgable and with a clear sense of purpose. If you summit, it will change your life. If you attempt it, it will change your life. But no matter the results, the experience is what you take away – not the summit. Research, train, prepare and climb with confidence. The reward is worth the pain. The summit is worth the cost.